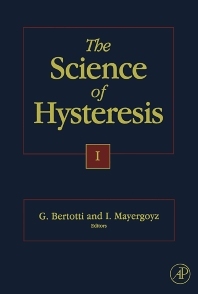 Applied mathematicians, physicists, engineers, materials scientists and economists engaged in the fundamental study of hysteresis and its far-reaching applications. Hysteresis in Magnetic Materials. 2. Magnetic Hysteresis in Nanostructured Materials. 3. Superconducting Hysteresis. 4. Hysteresis in Piezoelectric and Ferroelectric Materials. 5. Hysteresis in Shape-Memory Materials. 6. Hysteretic Elastic Systems: Geophysical Materials. 7. Application of the Preisach Model to Soil-Moisture Hysteresis. INDEX. Giorgio Bertotti is a senior scientist at INRIM, Istituto Nazionale di Ricerca Metrologica (previously known as IEN Galileo Ferraris), in Torino, Italy, where he has been a researcher since 1979. His research interests are in the field of magnetism and magnetic materials, hysteresis modeling, thermodynamics, noise phenomena. He is author of more than 200 scientific articles and of the book "Hysteresis in Magnetism".